It may not give you ‘The Drive of Your Life’, as its makers Peugeot may try to claim, but the latest micro electric car is creating huge excitement in the automotive industry. 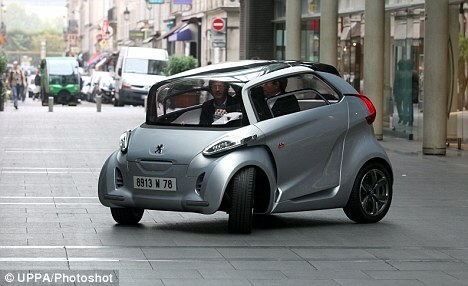 The Peugeot BB1, a cross between a scooter and a car, is powered by two electric motors which are mounted in the rear wheels. A silver prototype BB1had residents and tourists stopping to take a closer peak when a prototype version rolled into Paris today. Inspired by Peugeot’s electric VLV from the 1940s, the new all-electric BB1 represents the car firm’s view for the future of electrical-based urban mobility. Don’t know about anyone else but to me that doesn’t really look that great. I would not be seen driving around in one of those.